Thomas FORD (1590 – 1676) was Alex’s 10th Great Grandfather; one of 2,048 in this generation of the Miller line. Thomas Ford was born on 6 Jan 1589/90 in Dorchester, Dorset, England. Alternatively, he was baptized 6 Jan 1590 in Powerstock, Westmilton, Dorsetshire, England. [It was originally known as ‘Poorstock’ but this was changed to ‘Powerstock’ when the Bridport Railway was built in 1857, possibly to avoid connotations of poor (rolling) stock] The two towns are 13 miles apart. His parents were John FORD and Joan BECK. He married Joanne Way in England. After Joanne died, he married Elizabeth CHARD Cooke on 19 Jun 1616 in Bridport, Dorset, England. He emigrated in 1630 on the Mary & John and founded, with the rest of the company, the new Dorchester. After Elizabeth died, he married Mrs. Ann Scott on 7 Nov 1644 in Windsor, Hartford, Connecticut. Thomas died 9 Nov 1676 in Northampton, Mass. Joanne Way was born in England. Her parents were George Way and [__?__]. Joanne died 10 May 1615 in England. Elizabeth Chard was born in Dorset, England. Her parents were Thomas CHARD and Elizabeth BUNCKHOM. Her first marriage was to Aaron Cook on 2 Sep 1610 in Thornecombe, Dorset, England. She had one child, Major Aaron Cook Jr from this marriage. Elizabeth died 18 Apr 1642 in Windsor, CT.
Ann [__?__] Scott was the widow of Thomas Scott. Thomas and Ann had one child, Ann born about 1657, who married Thomas Newbury on 12 Mar 1676/77 in Windsor CT. Ann died on 5 May 1675 in Northampton, Mass. 1635 in Watertown, Mass 29 Aug 1663 Groton, Mass. b. Major Aaron Cooke bapt. Bridport, Dorset, England Mary Ford? Dec 1635 Dorchester, Mass. 6 Jul 1688 Northampton, Mass. Thomas was one of the early settlers of Windsor, CT. He was deputy to the General court in 1637, 1638, 1639 and 1640, and grand juror in 1643. He removed to Northampton, and probably at the same time with John STRONG in 1659. He exchanged, Dec 10, 1660, his home-lot and lands in Windsor with Edward Elmer, in Northampton. Powerstock is six miles northeast of Bridport. Many Fords lived at Powerstock, some of whom were known as “Ford alias Symes.” There were two Thomas Fords married at Powerstock during this time frame. One Thomas Ford married 29 Jan 1607/08 Julian Dun. Florence, baptized in 1608; Thomas, 1610 and Julian, 1615 are probably children of this Thomas Ford. Our Thomas Ford married 13 Dec 1610, Joane Way; this is probably the Thomas Ford who emigrated to Dorchester MA. Two daughters of Thomas Ford are baptized within a few months in 1612/13: Mary on 18 Aug 1612, and Sarah on 6 Jan 1612/13. Presumably one was the daughter of each couple, but there is nothing in the parish registers to tell which is which. After 1613 apparently only one Thomas Ford had children baptized. The burial of “Joane Ford” is recorded on 10 May 1615. Meanwhile at Thornecombe, Dorset, England, Aaron Cooke married Elizabeth Charde on 2 Sep 1610; Aaron Cooke was buried 28 December at Bridport, Dorset, and the widow, Elizabeth (Charde) Cooke, married Thomas Ford at Bridport 19 June 1616. Thomas and Elizabeth had two children baptized at Bridport, and three more at Holy Trinity, Dorchester, Dorset. If Thomas Ford of Powerstock is the Thomas Ford who married Elizabeth, he had a daughter Mary or Sarah from his first marriage. Thomas and Elizabeth Ford of Bridport named their first daughter Joan, a compliment often paid a deceased wife. It is tempting to believe the young widower of Powerstock was the one who married the young widow of Bridport. Major Aaron Cooke was the son of Aaron and Elizabeth (Charde) Cooke; he now became the step-son, or son-in-law in the terminology of that day, of Thomas Ford. It was commonly believed that Major Aaron Cooke’s wife was Mary Ford, based upon Thomas Ford calling Aaron son-in-law; now we see there was an alternative explanation for the use of the term. Also Banks lists a daughter Mary Ford on the passenger list of the “Mary and John,” but Banks’ list is compiled after the fact and is partially hypothetical, and he may have included Mary Ford out of the common belief that Aaron Cooke married the daughter of Thomas Ford, and Aaron’s wife was Mary. Aaron Cooke may well have married his step-sister, a frequent occurrence in those times, and that is the view taken in this genealogy, but alternative hypotheses as to the identity of Aaron Cooke’s wife are possible based upon these facts. Dawes-Gates did not believe Mary was a child of Thomas Ford, as she was not included among his heirs. Colony records do not give the name of Aaron Cooke’s wife, and some sources have called her Miriam rather than Mary. Some have taken the immigrant Thomas Ford to be the son of Nycholas Ford and Jelyn Long, who were married in Symondsbury 14 Oct 1588. There was a Thomas Ford, son of Nicholas Forde, baptized 6 Jan 1590 in nearby Powerstock. But if he were the Thomas Ford who married Joan Way 13 Dec 1610, he would have been only 20 and she would have been 27. It seems more likely that Thomas Ford the immigrant is the son of John Ford, and the one mentioned in the will of Thomas Forde of Dorchester in 1610/1611. Rev. John White, rector of Holy Trinity, was so deeply interested in the early emigration to New England that he has been called the “Founder of Massachusetts.” In the summer of 1629, White wrote to Gov. Endicott at Salem Mass. to appoint places of habitation for 60 families of Dorsetshire which were to arrive the following spring. Great care was taken to enlist in this company the elements of a well-balanced community. There were two devoted ministers: Messrs. Maverick and Warham, two stockholders of the London financing company: Messrs. Rossiter and Ludlow, three men with military experience, and “several men past middle life with adult families and good estates” — which included [our ancestor] Maj. John MASON, Thomas FORD, in addition to many “active, well-trained young men” — such as Thomas’ son-in-law, Roger Clapp. Also aboard the ship who founded the town were William Phelps, Roger Ludlowe, John Mason, Samuel Maverick, Nicholas Upsall, Henry Wolcott and other men who would become prominent in the founding of a new nation. In mid-March 1629/30 a company of about 140 persons met at Plymouth, Devonshire, where the “Mary and John“, a ship of 400 tons, had been chartered and fitted out. They spent their last day in England at the New Hospital keeping a solemn day of fasting and prayer. They formed their church organization and bound their ministers to them, this being the first church body to be transferred to the Bay Colony. Thomas and Elizabeth were doubtless members. On 20 Mar 1629/30 the company sailed from Plymouth, England. The voyage lasted 70 days. At the time they immigrated, passage cost £5 for an adult, £10 for a horse, and £3 for a ton of freight. Captain Squeb, master of the vessel, was supposed to land the travelers on the Charles River, where Rev. White had requested their colony to be placed. Instead he dropped them, their cattle and goods ashore at the barren, uninhabited Nantasket Point on May 30, 1630. An exploration party was sent out, and the group decided to place their settlement at a narrow peninsula known as Mattapan or Mattaponnock, and today is known as Columbia Point (more popularly since 1984 as Harbor Point). The site could accommodate the colonists’ cattle safely with a minimum of fence building, and there was forage and numerous springs in the area. So with considerable inconvenience and additional expense, the group moved their cattle and baggage to the new settlement early in June 1630. The name of this settlement was officially changed to Dorchester on 7 Sep 1630. Dorchester is a dissolved municipality and current neighborhood of Boston, Massachusetts, United States. It is named after the town of Dorchester in the English county of Dorset, from which Puritans emigrated and is today endearingly nicknamed “Dot” by its residents. Dorchester, including a large portion of today’s Boston, was separately incorporated in 1630. It was still a primarily rural town and had a population of 12,000 when annexed to Boston in 1870. Railroad and streetcar lines brought rapid growth, increasing the population to 150,000 by 1920. It is now a large working class community with many African Americans, European Americans (and is still a center of Irish American immigration), Caribbean Americans, Latinos, and East and Southeast Asian Americans. Recently, there has been an influx of young professionals, gay men, and working artists to the neighborhood, adding to its diversity. On the basis of his prior church membership, Thomas requested admission as freeman of the Bay Colony 19 Oct 1630, and took the oath of freeman 18 May 1631. The very earliest Dorchester records have been lost, but the records of 1633 tell of the election of 12 townsmen, later selectmen, two of whom were Thomas Ford and George Hull. January 6, 1633/34 Thomas Ford and Roger Clapp were placed in charge of collecting a tax to build a fort upon the Rock. Ford also was charged with viewing fences, surveying land and caring for three of the bulls of the town herd during his time at Dorchester. Dorchester was first centered around the First Parish Church of Dorchester, which still exists as the Unitarian-Universalist church on Meetinghouse Hill and is the oldest religious organization in present-day Boston. On October 8, 1633 the first Town Meeting in America was held in Dorchester. Today, each October 8 is celebrated as Town Meeting Day in Massachusetts. Dorchester is the birthplace of the first public elementary school in America, the Mather School, established in 1639. The school still stands as the oldest elementary school in America. Thomas Ford is last on record at Dorchester July 5, 1636, and probably removed to Windsor CT soon after that, although the first record of him there is in 1637 when he was granted a house lot in Windsor, 268 wide, backed to the Great Meadow. He sold this lot before 1648 and in 1656 bought the original homestead of William Hosford from Stephen Taylor, Hosford’s son-in-law. Thomas lived here until he moved to Northampton MA. That is the lot later left to Zerubbabel Fyler [who married son-in-law Elder John Strong’s daughter Elizabeth]. 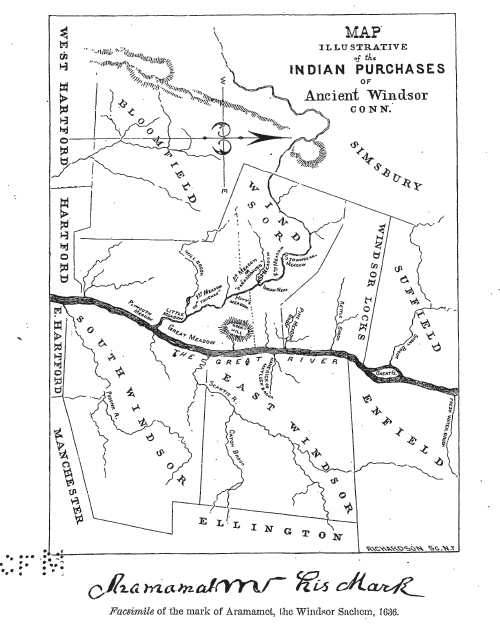 In 1637 Thomas was one of four men who purchased for Windsor, from sachem Tehano or Nehano, a large tract of land covering the present town of Windsor Locks, the northern third of Windsor and the southern part of Suffield. In 1640 he was granted nearly half of Pine Meadow (now Windsor Locks), near the Connecticut River and Kelle Brook. This he used for cultivation and timber. In 1656 he sold 30 acres to William Gaylord Jr., and in 1663 he sold land with 8,700 ft. width to Henry Denslow. The latter was killed there by Indians in 1676. Thomas was active in civic affairs, serving as deputy to the General Court from Windsor, and on numerous juries between 1641 and 1662, and he was a plaintiff and defendant in various suits. He was part of a committee of six appointed by the General Court to plan the best land use for the adjoining communities of Windsor, Hartford and Wethersfield. In 1655 he was made Constable of Windsor. He was chosen again the next year, with his son-in-law, John Strong. While he lived in Hartford he continued to hold large properties in Windsor. In the will of George Way of Dorchester, co. Dorset, merchant, dated 30 Sep 1641, signed 1 Oct 1641, proved 3 Dec 1641 (P.C.C. 155 Evelyn) there is a clause which reads “And whereas there is of my estate four and thirty pounds in money in Thomas Ford’s hands in New England and in the hands of Roger Clap and Stephen Taylor in New England”. In June 1644, the General Court voted that each of the three River towns should arrange that some responsible inhabitant “keepe an Ordinary” as accommodation for strangers passing through. Soon after his marriage to Ann, Thomas Ford moved to Hartford and established the first tavern there, in the home of her former husband Thomas Scott, standing at the corner of State and Front streets. John Winthrop Jr. visited the inn on 17 November 1645 and noted it in his journal. Soon after his marriage Thomas purchased a house and two acres of land in Hartford from Samson Shore. Thomas maintained the inn until 1648. Although he kept his lands at Windsor, on 9 March 1652 he sold the tavern to Thomas Cadwell. Today, the Arch Street Tavern, located around the corner the tavern Thomas established 367 years before was just voted best happy hour in the state by Connecticut magazine. The Front Street District is the final phase of Adriaen’s Landing, a state and privately-funded master planned development intended to attract activity to downtown by way of residents, retail, and other commercial activity. The plan includes the existing Connecticut Convention Center, Connecticut Science Center (opening spring 2009), and the 409 room Marriott Hartford Hotel. The Front Street District is a major development project in downtown Hartford. is located directly across Columbus Boulevard from the Connecticut Convention Center and the Marriott Hotel. When completed, the project will include 150,000 square feet of building area that will be occupied by restaurant, entertainment and retail spaces. In total, over $1 billion of public and private capital has been invested in new development projects in downtown Hartford including the Adriaen’s Landing master plan area. About 1647 Thomas Thornton sold his Windsor property to Thomas Ford and Ford’s son-in-law, John Strong and removed to Stratford, CT.
Thomas Ford was sued by Magistrate [Major?] William Whiting for slander in 1646/47; Thomas was fined more than £4 and costs of court. I can’t find what the slander was about, but I did find the William Whiting was very wealth and he died the next year. Money and power can’t buy you everything. Major William Whiting (1600-1647) was at Hartford in 1636, a wealthy merchant who had been engaged in a patent for lands at Swamscot with Lord Say and Lord Brook. He was an early member of First Church, and his name is on the Founders Monument of Hartford. In 1637 Whiting was one of the first representatives; in 1641, Assistant; and he served as Treasurer of the Colony from 1643 to his death in 1647, when he was called Major . William made several voyages, making his will 20 March 1643 in anticipation of one. A codicil drawn 2 April 1646 also mentioned a voyage, but it may have been only to the Delaware river, where he maintained a trading house, as also at Westfield. An addition to that will was declared 24 July 1647, and he died soon after, for his widow was granted administration on 2 Sep 1647. Thomas may have lived for a time in the wilderness on the land granted him at Massaco, but by February 1654/55 he had returned to Windsor, where he was chosen constable. In 1659/60 Thomas paid 6 shillings for his seat in Windsor church, and in 1660 his wife Ann joined that church. John Winthrop’s Medical Journal refers to him as “Old Thomas Ford of Windsor” in 1668, and he was listed as one of the freemen of Windsor in October 1669. 1 Mar 1654 – Walter Fyler, baving charged [Rev.] Mr. Stone [of Hartford] with the breach of a fundamental law, and upon the Elders in general sin and wickedness, opportunity given [to prove his charges] but he could not make it out, but did multiply offences in open Court, fined £5, bound with David Wilton and Thos. Ford in £20 to appear at next court: next year was freed from his recognizance. 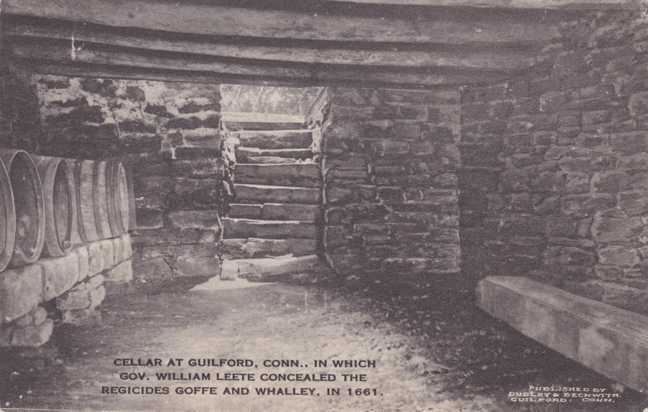 Thomas Ford and his step-son Aaron Cooke were loyal friends to the regicides Goffe and Whalley. Edward Whalley (c. 1607 – c. 1675) was an English military leader during the English Civil War, and was one of the regicides who signed the death warrant of King Charles I of England. At the Restoration, Whalley, with his son-in-law, General William Goffe, escaped to North America, and landed at Boston on July 27, 1660, where they were well-received by Governor John Endecott and visited by the principal persons of the town. They went about quite openly, and chose to live in Cambridge, just across the river. By February 1661, the Governor seems to have had second thoughts about welcoming the regicides so warmly and on the 22nd summoned a court of assistants to discuss their arrest, but the court would not agree to such action. Whalley and Goffe decided they were no longer safe in Cambridge and left on the 26th. Within a few days, orders arrived from England for their arrest. The two fled for New Haven, Connecticut when their safety was compromised, where John Dixwell, also condemned as a regicide, was living under an assumed name. They were housed by Rev. John Davenport. After a reward was offered for their arrest, they pretended to flee to New York, but instead returned by a roundabout way to New Haven. In May, the Royal order for their arrest reached Boston, and was sent by the Governor to William Leete, Governor of the New Haven Colony, residing at Guilford. Leete delayed the King’s messengers, allowing Goffe and Whalley to disappear. They spent much of the summer in Judges’ Cave at West Rock. Whalley left New Haven for Hadley, Massachusetts. In Hadley he (some sources say both men journeyed to Hadley) found shelter in the home of Reverend John Russell, who had grown up in Cambridge and graduated from Harvard College in 1645. Every attempt by the English government to procure his arrest failed. He was alive, but in poor health, in 1674, and probably did not live long afterwards. Thomas obtained land in Northampton MA as early as 1660, when he made an exchange with Edward Elmer. In 1668 Thomas Ford gave a conditional bond for deeding the homestead, after the death of he and his wife, to Zerubabel Filer, if he should marry Thomas’ granddaughter Experience Strong. These two married 27 May 1669 and Experience received the deed 23 August 1672. Between 1670 and 1672 Thomas and Ann removed to Northampton, where they lived the remainder of their lives. Thomas left no will, but the inventory of his estate taken January 4, 1676/77 showed property worth over £369. Administrators were his son-in-law John STRONG, grandson Preserved Clapp, and daughter Hepzibah (“good wife Marsh.”) Ford was called “a man of energy and influence who made his impress on posterity through three or four daughters’ of excellent worth”. The inventory of the estate of Thomas Ford was taken 4 Jan 1676/7 and totalled £195 17s. 9d., with no real estate included [HamPR 1:187]. COMMENTS: Thomas Scott’s daughters all married in the early 1640s, so their mother must have been born very early in the century (if not before 1600), and all these daughters were probably born in the 1620s. But the widow of Thomas Scott, after her marriage with Thomas Ford, is supposed to have had a daughter who married in 1676/7, and so may have been born about 1657. For all this to happen, the widow of Thomas Scott must have been a second wife, and not the mother of his daughters. Aaron’s first wife Mary Ford was born 18 Aug 1612 in Powerstock, Dorset, England. Mary and Aaron were step-siblings, but not related by blood. Her parents were Thomas FORD and Joan Way. Mary died in 1645. Aaron’s second wife Doanna Denslow was born 1622 in Netherbury, Dorset, England. Her parents were Nicholas Denslow and Elizabeth Doling. Doanna died Apr 1676 in Windsor, Hartford, CT.
Aaron’s third wife Elizabeth Nash was born 3 Jan 1647 in New Haven, New Haven, CT. Her parents were John Nash and Elizabeth Tapp. Elizabeth died 3 Sep 1687 in Northampton, Hampshire, Mass. 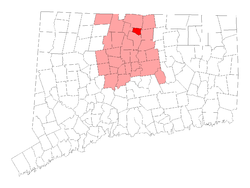 Aaron’s fourth wife Rebecca Foote was born in 1634 in Wethersfield, Hartford, CT. Her parents were Nathaniel Foote and Elizabeth Deming. Rebecca died 6 Apr 1701 in Hadley, Hampshire, Mass. 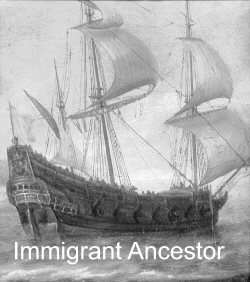 Aaron immigrated on 30 May 1630 to Nantasket Bay, Plymouth, Mass on the the ship Mary & John. He served in the military between 1653 and 1687 in CT. Aaron served in the King Philip’s War. Aaron first married Mary Ford in 1637 in Dorchester, Norfolk Co., MA. Children were: Joanna Cooke, Aaron Cooke, Moses Cooke. He was married to Joanna Denslow about 1650 in Windsor, Hartford Co., CT. Children were: Samuel Cooke, Elizabeth Cooke, Noah Cooke. Joanna’s husband Roger Clapp was born 6 Apr 1609 in Salcombe Regis, Devon, England. His parents were William Clapp and Johan Channon. 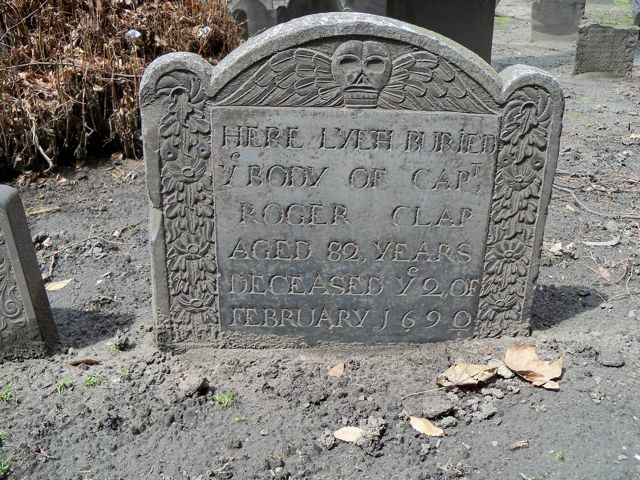 Roger died 2 Feb 1691 in Boston, Suffolk, Mass. FREEMAN: 14 May 1634 [MBCR 1:368]. EDUCATION: Both Roger and Joan signed their 1680 deed [SLR 12:227]. Roger presumably penned his Memoirs, showing considerable education. Appointed Lieutenant of the Dorchester company, 6 May 1646. Admitted to the Ancient and Honorable Artillery Company in 1646 . 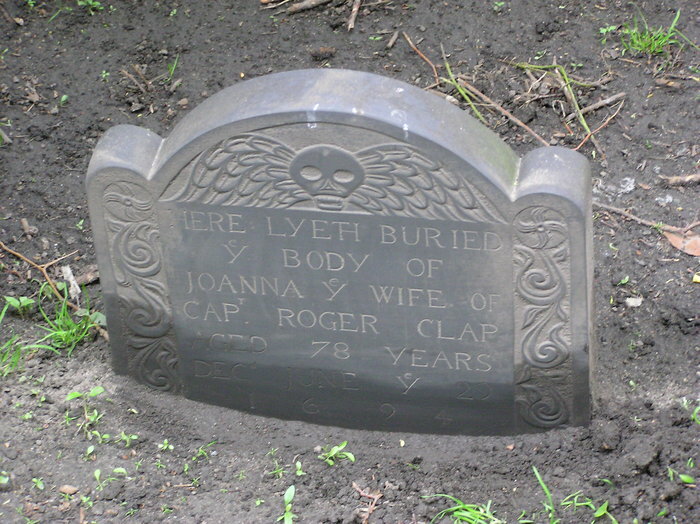 Roger Clapp Gravestone — Kings Chapel Burying Ground , Boston, Suffolk County, Mass. Hepzibah’s first husband Richard Lyman was born 24 Feb 1618 in High Ongar, Essex, England. His parents were Richard Lyman and Sarah Osborne. Richard died 3 Jun 1662 in Windsor, Hartford, CT.
Henry Ward Beecher, Harriet Beecher Stowe, Samuel Colt (Colt Revolver) and Charlotte Perkins Gilman are Descendants. Richard and Hepzibah removed to Northampton in 1655 ; he d. June 3, 1662 ; his widow m. John Marsh, of Northampton, who soon after removed to Hartford. Hepzibah’s second husband John March was born Apr 1618 in Braintree, Essex, England. His parents were John Marsh and Grace Baldwin. He first married1642 in Hartford, Hartford, CT to Anne Webster (b. 29 Jul 1621 in Cossington, Leicestershire, England – d. 9 Jun 1662 in Hadley, Hartford, CT). John died 28 Sep 1688 in Windsor, Hartford, CT.
BIBLIOGRAPHIC NOTE: As with other families which quickly daughtered out, the best treatments of Thomas Ford appear in various “all-my-ancestor” books. One excellent account by DeForest is replete with biographical data and other information which places Ford in historical context [Moore Anc 248-63]; unfortunately, however, DeForest pads his account with an overlong extract from Roger Clap’s memoirs, which is perhaps justifed because a daughter of Thomas Ford married Roger Clap, but which does not really have much to say about Ford. A more concise, but more genealogically informative version is that prepared by Mary Holman [Stevens-Miller Anc 1:354-56]. The basic research on the English records for Thomas Ford was published by Jacobus and Torrey in 1939 [TAG 16:41-43]. In this article are some records for a Thomas Ford of Powerstock, Dorsetshire, which may or may not be relevant to our Thomas Ford. Torrey had earlier presented evidence on AARON COOKE which showed that he was stepson rather than son-in-law of Thomas Ford [TAG 11:179-80]. This entry was posted in 12th Generation, Double Ancestors, Immigrant - England, Line - Miller, Pioneer, Public Office, Tavern Keeper and tagged Dorchester Pioneer, Goffe and Whalley, Kissing Step Siblings, Signature, The Mary and John 1630, Windsor Pioneer. Bookmark the permalink. Coat of Arms removed. In reality, Thomas Ford was not part of the gentry and did not have a coat of arms when he came to America. Mike, you have written that “Thomas Ford and his step-son Aaron Cooke were loyal friends to the regicides Goffe and Whalley,” but don’t indicate what, if anything, they did on their behalf. What are the facts? I am glad my site has been helpful. 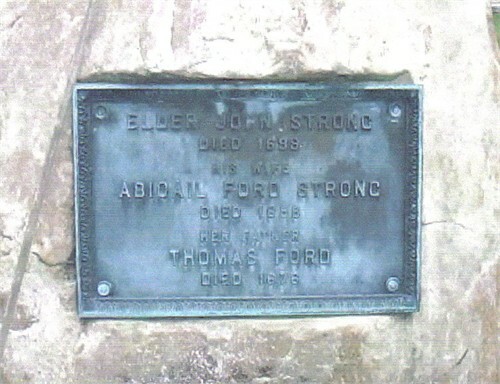 The plaque lists Elder Strong Thomas’s son-law, Abigail Ford Strong his daughter and Thomas Ford. Thomas Ford is my 12th gr grandfather. Can you provide a source for the signature of Thomas Ford?